Kasargod, Jan 22, 2016: A couple were critically injured when the speeding car in which they were travelling overturned at Mundyathadka near Kumble. 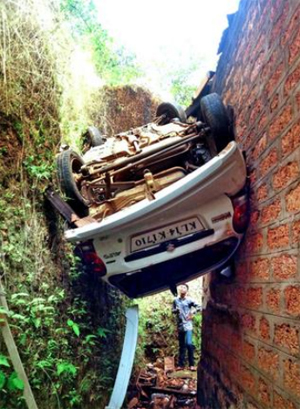 The car later fell over a house and got stuck beween the house and the compound wall. Those injured are Gopi and his wife Malathi. Gopi is a barber in Kumble. The couple are undergoing treatment at a hospital in Mangaluru. The accident took place as the driver was at a non-controllable speed. The impact car had toppled down. The compound wall has save the car from the accident still being major . Hopefully the wall of the house didn’t fall. What might be the state of the couple when the car fell off?